Safranbolu is the best preserved town in Anatolia. A rare blessing for those who would like to picture how an Ottoman town looked 200 years ago, Safranbolu, with its little-changed cobbled pavements and authentic marketplace is a virtual open-air museum. The sloping terrain at Safranbolu, which is situated in a deep canyon carved out by three rivers, produced interesting architectural solutions. 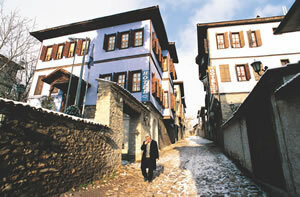 The stone-built ground floors of Safranbolu houses, most of which are two- or three-storey mansions, generally follow the natural gradient of the street. The upper stories meanwhile, supported by buttresses, may project over the street. Although the houses are built on small, oddly shaped lots, thanks to this building technique the upper level rooms are nevertheless rectangular and spacious. Another aspect of the technique is that the house’s axis can be rotated slightly on the upper stories according to need or exposure to the sun! The houses along the narrow streets of the marketplace thus rise twisting and turning like screw shells over the narrow and sloping plots of land to which they cling. 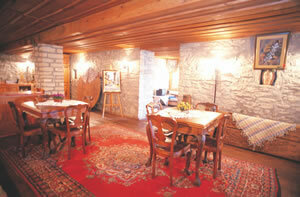 The interiors of the houses are as elegant as their exteriors. The low-ceilinged middle stories used in winter are cozy and warm like a womb while the upper floors, used in summer, are airy with high ceilings. The master bedroom, the most beautiful room with the best view, is usually situated on the topmost floor. This room, decorated with woodwork and stenciling, is where the master craftsmen exhibited all their skill. 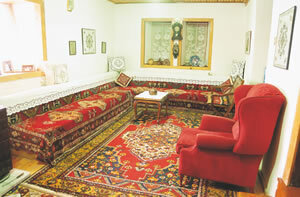 In typical Safranbolu houses, each room was furnished in such a way as to meet all the needs of the nuclear family. It is not for nothing that Safranbolu residents called each one of these rooms a ‘house’ since they could be a sitting room in the daytime thanks to divans running around the wall, simultaneously a kitchen thanks to the hearth, a bedroom thanks to the floor mattresses taken out of the cupboard at night, and a bathroom thanks to the washstand concealed in the cupboard! Because they were designed as independent units, each of the rooms was assigned a name such as ‘storage house’, ‘guest house’ or ‘dining house’. 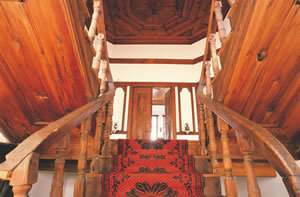 During the years when Safranbolu was becoming a popular destination for tourists, there was a constant stream of visitors to the traditional houses. The house owners, who at first welcomed the tourists hospitably, naturally tired of this human traffic with time. But just at that point the museum houses came to the rescue. The first of them, and perhaps the most beautiful, is the Kaymakamlar Evi, a house that was opened to visitors in 1981 following a restoration by the Ministry of Culture. 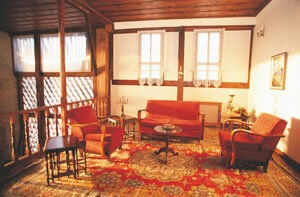 This mansion is one of the most flawless examples of the Safranbolu house. Meanwhile the Turing Havuzlu Konak, or Mansion with Pool operated by the Touring Club of Turkey, which began serving guests in 1989, is the first historic mansion in Turkey to have been converted into a hotel. The nicest surprise of this mansion, which greets visitors at the entrance to the town and was once owned by one of its wealthiest families, is the approximately 1.8 meter-deep pool that holds several tons of water in the living room—restored and used as a café today. Reference: Ozgur Gezer/Garo Milosyan, SKYLIFE.